You’re not supposed to judge a book by its cover, but these new Penguin Galaxy hardcovers make it really hard. 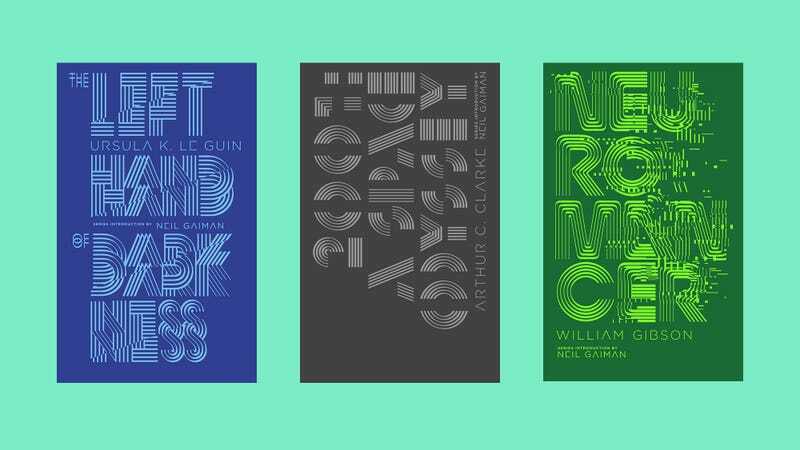 The publishing company ditched its iconic “classic” covers for more futuristic and playful typeface layouts in this rather expensive but beautiful boxed set of six classic science fiction and fantasy books. Penguin Galaxy’s set includes a bunch of books you’ve probably already read before: The Once and the Future King by T.H. White; Stranger in a Strange Land by Robert A. Heinlein; Dune by Frank Herbert; 2001: A Space Odyssey by Arthur C. Clarke; The Left Hand of Darkness by Ursula K. Le Guin; and Neuromancer by William Gibson. Most people probably wouldn’t buy this set just to read the books, though. What you’re actually purchasing is the iconic designs of cover artist Alex Trochut and the jewel-box lucite showcase that comes with the set. Penguin Galaxy also went a step further and asked Neil Gaiman, author of American Gods and Sandman, to write the series introduction. That makes this, officially, one of the coolest gifts you can get for your favorite scifi geek. The box set goes on sale October 25, but you can pre-order it now for $225.